Dr Ryan Joynson is a postdoctoral researcher at the University’s Institute of Integrative Biology, based within the Centre for Genomic Research. 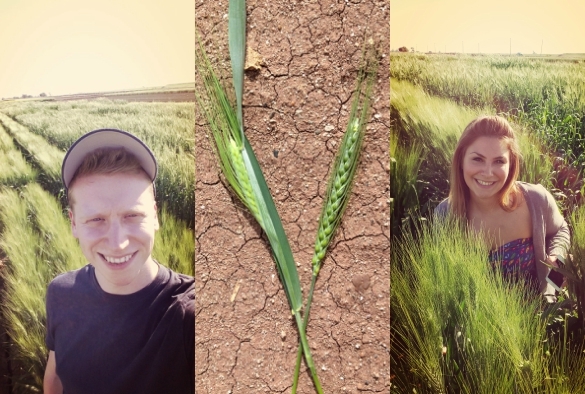 “I recently undertook a field research trip to the International Maize and Wheat Improvement Center (CIMMYT) in Obregón, Mexico with my colleague Dr Laura Gardiner. The trip was the first phase of an International Wheat Yield Partnership (IWYP) research grant working towards exploitation of phenotypic variation in photosynthetic efficiency to increase wheat yield, which is led by Professor Anthony Hall. Increasing wheat yield is a key priority for food security. The aim of our visit was to sample 530 hexaploid wheat cultivars (Triticum aestivum) from multiple diversity panels created by wheat breeders and plant physiologists at CIMMYT. During our stay we set up a small molecular lab space in which we extracted DNA from each of the samples taken. This DNA will be used to genotype the specially selected cultivars in order to identify genetic links between wheat lines that exhibit high grain yield along with highlighting the biochemical pathways that may be responsible for these traits. As two molecular biologists and bioinformaticians this trip was especially useful as it gave us the chance to meet with wheat breeders and scientists that were instrumental in the design and selection of the wheat lines that made up the panels we will be genotyping. This gave us the opportunity to learn more about aspects of field testing and allowed us to gain many contacts for future collaboration.